January 23, 2007: If you stare at the Moon long enough, you start seeing things. "82 things to be exact," says Bill Cooke, leader of NASA's Meteoroid Environment Group. That's how many "transient phenomena" the group has video-taped since they started monitoring the night side of the Moon in Nov. 2005. "In 107 hours of observing, we've tallied 20 lunar meteors + at least 60 Earth-orbiting satellites + one airplane + one terrestrial meteor = 82 in all." This is the first systematic count of lunar night-side phenomena. "It gives astronomers an idea of what to expect when they undertake a lunar monitoring program from Earth."
. "Of the 20 lunar meteors we've seen so far, about half come from well-known meteor showers such as the Leonids and Geminids. The other half are random meteoroids that take us completely by surprise." NASA is preparing to send astronauts back to the Moon and the agency is understandably interested in how often this happens. NORAD tracks more than 10,000 Earth-orbiting objects wider than 10 cm. "Some of them are bound to cross in front of the Moon while we're watching," he says. Objects like Orbcomm are easy to identify as satellites. Tumbling space debris, on the other hand, can be trickier: "A sudden glint of sunlight from a flat surface looks an awful lot like a lunar meteor flash," he explains. "So we have to be very careful. When we see a flash of light on the Moon, we always double-check that there was no piece of space junk passing by at that exact moment." Back in days of Apollo, astronomers who monitored the Moon didn't have this problem. "There were very few satellites in Earth orbit, and a lunar transit was rare," he says. "But now we see one or two every night."
?" laughs Cooke. "Airplanes are my favorite."
. This may seem puzzling. During a typical meteor shower, novice sky watchers see dozens of shooting stars. Why has NASA counted only one? 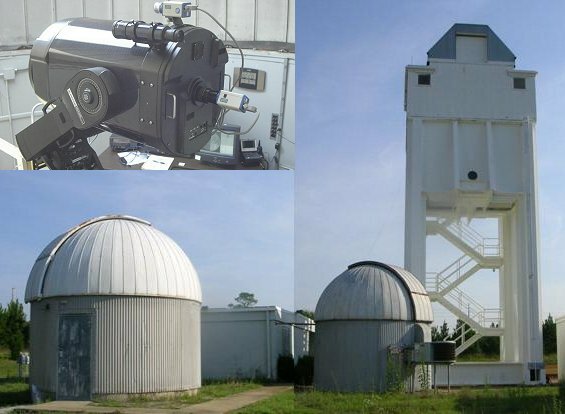 "The telescope's field of view is too narrow," explains Cooke. The human eye is much better for terrestrial meteor watching. He's more interested in the Moon, anyway. Exploding meteoroids, tumbling satellites and jet airplanes: "It's a great show." What's next? "We plan to keep watching, so stay tuned."
. Credit: The NASA Meteoroid Environment Group, MSFC. Farside vs. Nightside: This article tells what was seen during a survey of the lunar night side. The night side shouldn't be confused with the farside. "We can never see the farside of the Moon," Cooke says. "But we often see the night side. It's any lunar terrain not lit up by the Sun, like the dark half of a quarter Moon."